July, 2013: XLRI, the premier private B School in India, has started a financial literacy program among the unbanked population in adjoining villages across East and West Singhbhum districts through a newly launched project called "Sanchetana" and inaugurated the "Financial Literacy on Wheels" initiative at Jamshedpur in association with the State Bank of India. The event was inaugurated by Fr. E. Abraham, Director, XLRI Jamshedpur; Ms. Praveena Kala, Dy. General Manager, SBI Patna Circle; Mr. Basant Rath, RO, SBI Chaibasa Division; Dr HK Pradhan, Professor of Finance & Economics, & Chief Mentor of "Sanchetana" initiatives with the officers of SBI Chaibasa, XLRI Students and Faculty. The objective of the initiative "Financial Literacy on Wheels" under the ‘Sanchetna’ project is to spread awareness of savings, insurance & old age pension among the villagers and urban poor, coming closer to their homes. The student teams from XLRI would visit various public centers in remote villages like village meetings & festivals, schools, community associations, etc. to spread financial literacy using various forms of audio visual documents in villages in and around the district. The project ‘Sanchetana’ aims to educate the rural people on banking and investment options. XLRI students, research scholars and professors are organizing sessions with villagers, while, SBI is assisting them by bringing the rural populace under the fold of conventional banking. To penetrate remote areas, SBI is sending authorised agents who use the internet to open bank accounts for villages. The project was piloted at Saldih in Gamharia, located about 12km from the city, from May onwards. A number of sessions have been held at gram sabhas, schools, self-help groups for women and one-to-one interactions with villagers have yielded encouraging results. The volunteers from XLRI are also conducting counseling sessions with rural high school students so that they learn the concept of saving early on. Dr. H.K. Pradhan, Professor of Finance & Chief Mentor of "Sanchetana" initiatives said on the occasion,“Financial literacy is an irreducible need for everyone. Low-income and vulnerable consumers are not necessarily less financially literate than wealthier consumers. With this initiative, we intend to spread such awareness and make people conscious about their financial decisions. We have started with Saldih but we will move to other areas in East Singhbhum and West Singhbhum”. “The project ‘Sanchetna’ has succeeded in instilling the knowledge among the village people. In just over a month, people who had never been to a bank in their life, are operating accounts. As many as 500 accounts have been opened so far,” he added. “Financial literacy programs, can equip vulnerable participants to better navigate complex financial systems and highlight opportunities for positive change to public and private financial services and systems. I welcome this initiative undertaken by our team,” commented Fr. 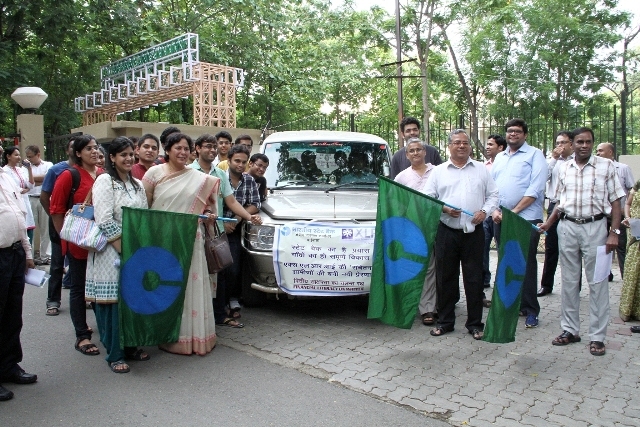 E. Abraham S.J., Director, XLRI Jamshedpur, flagging off the initiative. “We always seek to underscore XLRI’s mission on being a management school with a difference and uphold its commitment to inculcate a sensitive social conscience within future business leaders in the making” he added.